VUS iz dos? Suggestions For A Reasonable Policy On Reporting Genetic Variants of Unknown Significance. In a previous post, I raised questions about the appropriateness of certain billing policies for multigene cancer panels. As expected, it evoked some thoughtful and strongly felt comments and disagreements. But one thing we can all agree on about multigene panels is that the rate of detecting variants of uncertain significance (VUS) is way too high, usually in the range of 30-40%. It will be many years before we will be able to determine the clinical significance of most of these variants, even if collaborative VUS reporting among labs becomes a reality and – more concerning to me – the public databases are properly curated. Indeed, the high frequency of VUS may prove to be the Achilles heel of multigene panels particularly as genetic testing increasingly takes place outside of the realm of genetics specialists. So let me offer a solution that many genetic counselors will think is heresy and antithetical to basic genetic counseling philosophy. Stone, spitball, egg, and tomato me if you will, but my recommendation is that VUS should not be reported out by laboratories. Instead of reporting specific VUS, I suggest that all genetic test reports – and pre-test counseling notes and result letters that are sent to patients and care providers – include a clearly written and highly visible general disclaimer along the lines of: Variants of unknown clinical significance are very commonly detected on genetic tests. These variants cannot and should not be used to guide medical care or help better understand cancer risks, and therefore are not detailed here. We continually monitor and study these variants. In the uncommon event that a variant is eventually re-classified as pathogenic or otherwise important for guiding your medical care and assessing your health risks, you and your doctor will be promptly notified. A variant should be reported when the lab feels that there is a reasonable possibility that the variant might be clinically important. In those cases, labs should offer family studies if they think that the functional and clinical significance of the mutation can be clarified by studying families that segregate the specific mutation. 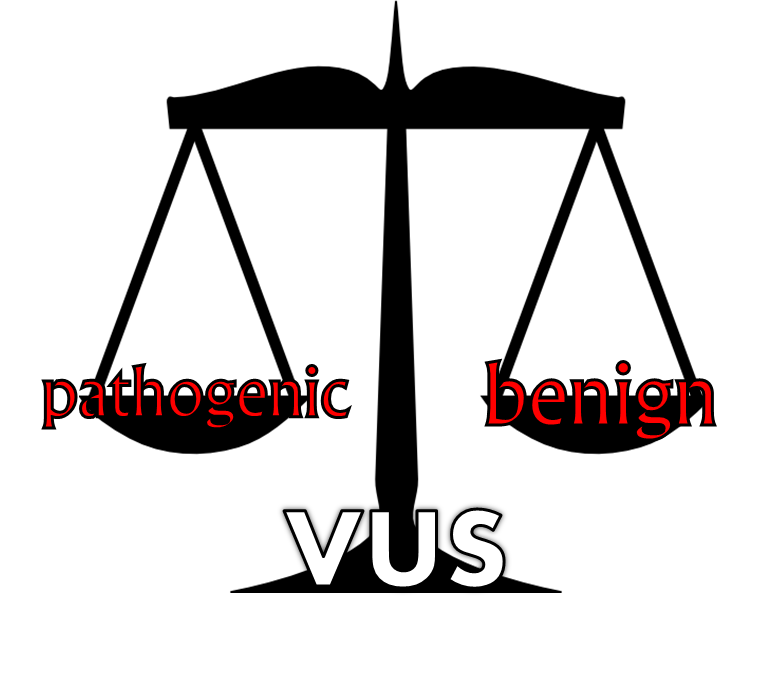 Of course, labs should be able to provide the VUS result – along with their rationale for classifying it as unknown rather than benign or pathogenic – if a patient or provider requests it. By the way, I prefer Variants of Unknown Significance over Variants of Uncertain Significance. Maybe I am nit-picking, but uncertain seems to leave more psychological wiggle room for patients and care providers to think “Hey, maybe this is important” while unknown suggests that we really do not know what it means. I can think of two reasons that help explain why we continue to report VUS to patients. One reason stems from our tendency to over-explain, the original sin of genetic counseling. In our desire to adequately inform patients we often overload them with a compressed course in advanced biology and genetics. In a form of counter-transference, we think of our patients as some version of ourselves and we sometimes unconsciously speak to them as if we were speaking to ourselves. Many genetic counselors are science nerds at heart and we tacitly assume that any rational person (i.e., someone who thinks like me) would want to know all those gloriously fine technical and scientific details. The second reason that we report out VUS is that our concept of a gene is stuck in about 1995 or so. Back then we envisioned genes as highly stable structures which would occasionally have a few mutant alleles, and therefore Mutation = Bad. In fact, mutations are strikingly common and only a few are of clinical or evolutionary significance. Mutations are the norm for genes, not the exception. This policy would require broad acceptance by the genetics community – genetic counselors, medical geneticists, genetics labs, and others. Perhaps a first step could be to conduct studies that randomly assign patients to two groups, one that receives VUS results and one that does not. Those patients could be followed for a period of time and then compare the two groups for differences in utilization of surgery and screening, as well as psychosocial adaptation and quality of life. Let’s modify our counseling philosophy to fit into the 21st century. Many of us may kick and scream at first because, well, it is so different from what we normally do. But once you get past the initial shock, relax and kick off your shoes, sip a beer, and think about it more clearly and calmly, you may begin to feel differently.